On Thursday, November 8th, B-L Elementary School hosted its annual Veterans Day Music Program and Art Show at the Fine Arts Center. Fifth grade students performed special patriotic songs, the Shelly’s Sassy Sistas team danced to “Boogie Woogie Bugle Boy,” and B-L Police Chief Wallace Oswald served as the Guest Speaker. 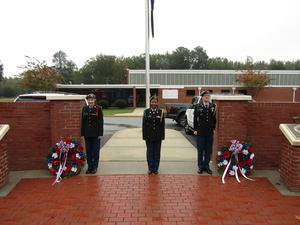 On Friday, November 9th, B-L Middle School held its Veterans Day Program in the school’s gymnasium. The B-L High School JROTC presented the colors, the B-L Middle School Band and Boys Choir performed, and Sergeant First Class (Ret.) James Hill gave the message. On Monday, November 12th, the B-L High School Panther Battalion hosted the school’s annual Veterans Day Program in the school gymnasium. Colonel Maxie Joye served as the keynote speaker, the Panther Band performed numerous patriotic songs, and members of the JROTC participated in several ceremonial events including an “Inspection of Cadets” and a “March in Review.” In addition to this program, the B-L High School JROTC also laid wreaths at the B-L Armed Forces Monument in front of the National Guard Armory in recognition of Veterans Day. Lexington Three salutes all veterans for their sacrifices and service to our country.